Distaclor is used to treat bacterial infections. Distaclor, which contains an active ingredient called cefaclor monohydrate, is classified as a cephalosporin antibiotic. It is used for the treatment of certain infections caused by susceptible bacterial strains, such as ear, throat (e.g., tonsillitis and pharyngitis), lung (e.g., pneumonia and bronchitis), skin, and urinary tract infections. Distaclor works in a similar way to penicillin antibiotics. It binds to specific proteins on the inside of the bacterial cell wall, thereby preventing completion of bacterial cell wall production. Substances called enzymes then rupture the cell wall, causing the bacterium to disintegrate. Can I buy Distaclor online? 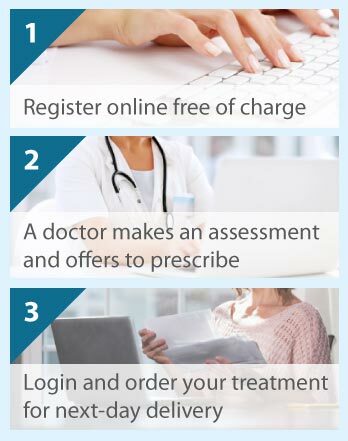 The Online Clinic can prescribe Distaclor following an online consultation with a doctor. Please click on the free consultation button to proceed. Distaclor may be taken in the form of capsules (500 mg), long-acting MR tablets (375 mg), or as an oral suspension (125 mg/5 ml and 250 mg/5 ml). The dose regimen, including strength of medicine, frequency of administration, and duration of treatment will depend on the type and severity of bacterial infection. Distaclor MR should be taken with meals. The tablets and capsules should be swallowed whole only – not broken up or chewed. Always follow your doctor’s instructions or the bacteria may not all be killed and the infection may return. Take a forgotten dose as soon as possible (but do not take two doses at once), contact your doctor if you miss a few doses in succession, and seek medical assistance quickly if you take more medicine than recommended. Distaclor is prescribed for adults and elderly people. Children should not take Distaclor MR tablets, while the capsules and suspension are not recommended for infants younger than one month of age. You should not take Distaclor if you are allergic to its active ingredient cefaclor, its other components, or other cephalosporins. You may also not be able to take Distaclor if you are hypersensitive to penicillin, experience diarrhoea while on antibiotic treatments, have severe renal impairment, or have some hereditary problems regarding sugar absorption or intolerance. Women who are pregnant or breastfeeding, or planning to become pregnant or to breastfeed, should first discuss their situation with their doctor before taking this medicine. All your immediate past, present, and possible future medicines, regardless of whether they are chosen by yourself at a chemists or prescribed by a healthcare professional, must be disclosed to your doctor. In particular, mention the blood thinner warfarin, the gout treatment probenecid, and heartburn and indigestion medicines known as antacids that contain magnesium/aluminium hydroxide. Distaclor capsules can interfere with blood or urine tests, so let the healthcare professional know before having such tests. While rare, allergic reactions with symptoms such skin rashes and itching, swelling of the lips, tongue, face or throat, or breathing difficulties can occur. Side effects considered serious include severe skin blistering/peeling, and severe diarrhoea with or without blood or mucus. If you experience an allergic reaction or serious side effect, stop taking Distaclor and report all such effects immediately to a doctor. People have reported the following side effects while taking Distaclor: diarrhoea, nausea and vomiting; skin rashes (e.g., measle-like rash, wheals) alone or with joint pain/stiffness; swollen lymph glands, arms or legs; breathlessness; vaginal thrush; changes in blood constituents (you bruise easily or feel tired); kidney (e.g., cloudy urine) or liver (e.g., jaundice) problems; fever; weakness; pins/needles in hands/feet; fainting and dizziness; and agitation, nervousness, insomnia, confusion, and seeing or hearing things. Most patients do not get any side effects whatsoever.